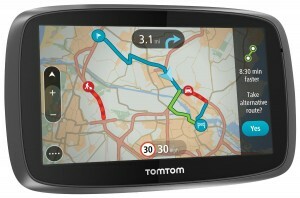 The TomTom GO 500 comes with a 5-Inch widescreen display, complete with lifetime traffic and map updates.when compared to previous sat navs from TomTom, you will notice that the Go 500 has undertaken a change in physical design, finished off with a totally redesigned menu system and reassessment of interactive features. This sat nav’s works in a much different way as compared to previous TomTom sat nav units. Gone are the days when you need to press the map in order to call up the menu. Instead, you need to look to the bottom left-hand side of the screen and utilise the circle that contains four dots. As compared to previous TomTom generations, the menu itself is completely different, with an erasure of the traditional division between Points of Interest and addresses. As an alternative, a single Search option directs you to a two-paned results screen with POIs on the right and addresses on the left. By way of a keyword, you can enter an address or POI, minus having the knowledge of which town either is in. Generally speaking, the menu system is very effortless to use. A My Places option is available to enable you find the way to a Home location, favourite or recent destination. In addition, parking and petrol stations to the areas are also included on the menu entries. Although the menu may feel sparse, the uncluttered interface makes it all the more worthwhile. Where previously you would have found text, you will now find icons. Apart from the completely redesigned menu, another change that can be noticed with the GO 500 is a live-enabled device, regardless of not having a model name with LIVE in it. What this means is that save for the more advanced features of LIVE TomToms, you get live traffic updates and traffic updates. In case you wish to utilize the LIVE services on the TomTom GO 500, you will have to make use of your smartphone’s data link by way of a Bluetooth connection. It makes use of Bluetooth Tethering on Android and Personal Hotspot function on iOS. 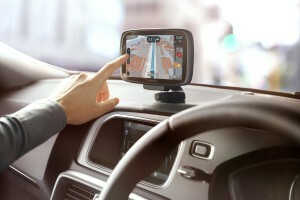 As a minimum, TomTom specifies Android 4.0,iOS 6 or Blackberry 10 although you may find no difficulty in connecting to services via an iPhone running iOS 5.1.3. Following the hook up to a smartphone, the two LIVE services accessible are traffic and speed cameras. Much as the traffic service is for the lifetime of the sat nav unit, following a three month free trial, the speed camera updates require a paid-for subscription. A number of travellers make use of the services and thanks to TomTom, you will be able to get the most recent, detailed traffic service, seeing as it is frequently being updated. It’s recommended that your smartphone has enough power to maintain the connection for the duration of the journey lest you lose the service. 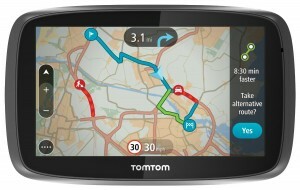 TomTom is however dubbed as having a minimal data consumption rate. Also not included on the LIVE services are extras such as local search, travel digests or weather.